Recently the communication from the Federal Reserve seems to have become more hawkish. It all started on July 15 when Fed chair Janet Yellen testified in front of the House Financial Services Committee. Yellen among other things said: “If the economy evolves as we expect, economic conditions likely would make it appropriate at some point this year to raise the federal funds rate target” This has been followed by comments from other Fed officials such as St. Louis Fed president James Bullard who in an interview with Fox TV on July 20 said that there was a “50% probability” a September rate hike. As my loyal readers know I like to watch the markets to assess monetary conditions. So lets see what the markets are saying about the US monetary policy stance right now – and how it has changed on the back of Yellen and Bullard’s comments. Lets start with the much talked about gold price. It is hard to miss that it was Yellen’s hawkish comments that has sent gold prices down in recent weeks. So the drop in gold prices certainly is a indication that US monetary conditions are getting tighter. But it would of course be wrong to reason from the change in one price. We need more – so how about the dollar? This is the so-called Dollar Index (DXY). Here the picture certainly is less clear than from the gold price. This has been followed by comments from other Fed officials such as St. Louis Fed president James Bullard who in an interview with Fox TV on July 20 said that there was a “50% probability” a September rate hike. As my loyal readers know I like to watch the markets to assess monetary conditions. So lets see what the markets are saying about the US monetary policy stance right now – and how it has changed on the back of Yellen and Bullard’s comments. Lets start with the much talked about gold price. 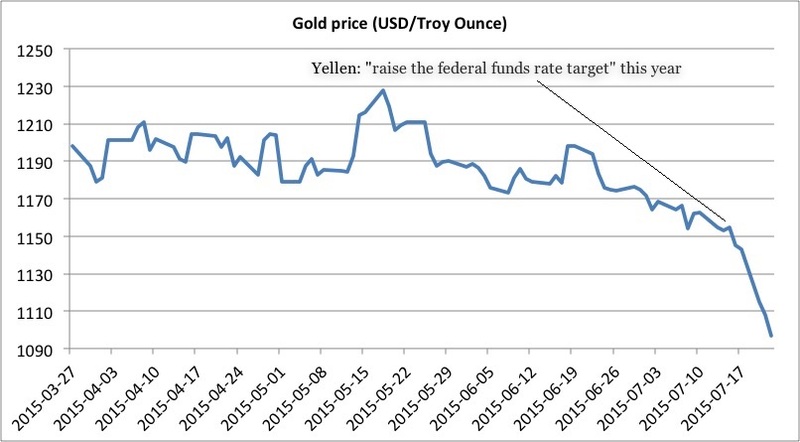 It is hard to miss that it was Yellen’s hawkish comments that has sent gold prices down in recent weeks. So the drop in gold prices certainly is a indication that US monetary conditions are getting tighter. But it would of course be wrong to reason from the change in one price. We need more – so how about the dollar? This is the so-called Dollar Index (DXY). Here the picture certainly is less clear than from the gold price. In fact the dollar index today is more or less a the same level as on July 15 when Yellen hinted at a rate hike this year. However, we should remember that the exchange rate is telling us something about the relative monetary policy, so if US monetary conditions is in fact getting tighter and the dollar index is flat then it is an indication that monetary conditions are also getting tighter outside of the US. Given the Greek crisis and Chinese growth worries this is not an unreasonable assumption. So how about inflation expectations? This is 2-year/2-year inflation expectations (so basically the expectation to the average inflation rate from August 2017 to August 2019) Again the picture is clear – after Yellen and Bullard’s comments 2y/2y inflation expectations have dropped and equally important this happened at a time when inflation expectations already where below 2%. It should also be noted that prediction markets are telling the same story. Hence, from some time Hypermind’s market for nominal GDP growth in 2015 has been somewhat below 4% (which I believe has been Fed’s unannounced target for some time – see here.) The Fed is too hawkish and rate hikes should be postponed Concluding, the Fed’s more hawkish rhetoric has de facto led to a tightening of US monetary conditions already, which has pushed inflation expectations below the Fed’s own 2% inflation target. So effectively the markets are tellling the Fed that monetary conditions are becoming too tight and a September rate hike as suggested by advocated by Bullard would be premature. So if I was on the FOMC I would certainly vote against any rate hike in the present situation.